"It may be in fact that I have taken on a task that is too much for me: there is no precedent, so I am obliged to invent new forms." — Claude Debussy. Unquestionably one of the most influential of modern composers, Claude Debussy (1862–1918) overturned traditional concepts of form, harmony, and coloring in creating a body of music characterized by innovation, individuality of style, and perfection of workmanship. 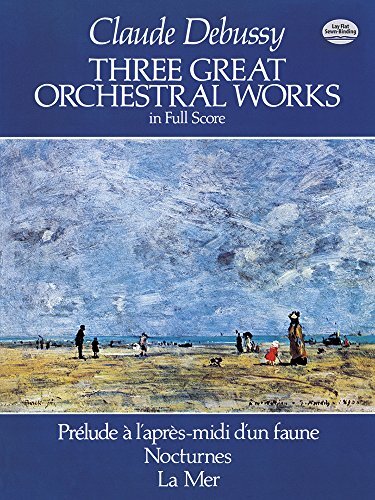 Among his most popular, most performed, most recorded works are the three compositions reprinted in this volume: the revolutionary Prélude à l'aprés-midi d'une faune, which, in a sense, "awakened" modern music; the exquisite Nocturnes, shimmering models of delicate impressionism; and La Mer, complex, suggestive, a masterpiece of orchestral texture. This Dover volume presents the complete scores of all three works — reproduced from early French editions — in one convenient source. Musicians and music lovers will appreciate this inexpensive edition of a trio of orchestral favorites: pieces that mark not only key points in the composer's personal progress but also in the progress of modern music as well.